Closest to home, the annual Lighting of the Quads will take place on December 4 at 9 PM. To get a flavor of this Hopkins tradition, check out last year’s ceremony. There will be gingerbread houses and prizes galore. Don’t miss this year’s bigger-and-better ceremony. Baltimore City also has an annual lighting event – the lighting of the Washington Monument in Mount Vernon. This year the event takes place on December 6, and includes music and fireworks! 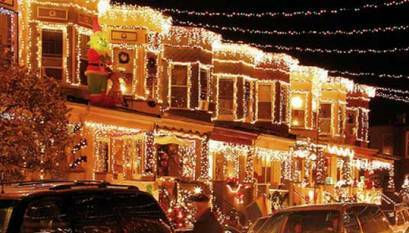 And do NOT miss one of Baltimore’s weirdest traditions: Miracle on 34th Street. Walk, bike, or drive over to the Hampden neighborhood. Now in its 65th year, this block-long display of lights, moving figures and sculpture is definitely a one-of-a-kind holiday experience. Some call it “gaudy, ugly,” and some call it “awesome, beautiful.” Either way, go see it and decide for yourself. If you just want to stay inside and find enlightenment, check out some holiday DVD’s from the library, or books on winter, or even read books online. Study Break in Mount Vernon! Woo Hoo!